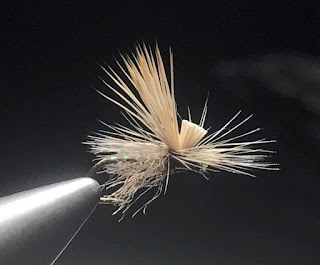 I posted a couple of photos recently on Instagram of Mercer's Missing Link Caddis and afterwards I got a bunch of emails and messages from folks that are having trouble tying it - specifically getting the hackle wrapped cleanly. Here's how I do it and it works quite well - pardon my photography skills. 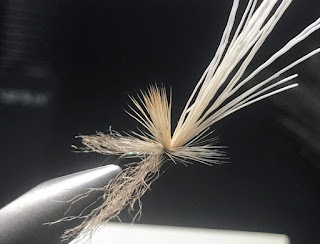 The trick here is to leave the wings - both the spent and the elk hair wing materials long until the hackle is completely wound and tied off. Spent wings - wrap tight to a ball of dubbing to flare them. 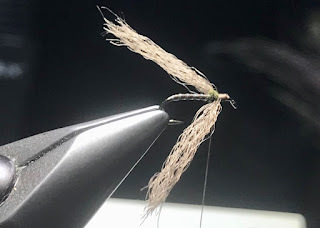 Elk Hair - Tie in on top of a nice even platform formed when tying in the spent wings. Hackle - Tie in in front of the elk hair butts and wrap counter-clockwise looking from above for a right handed tyer, and tie off behind the hook eye. 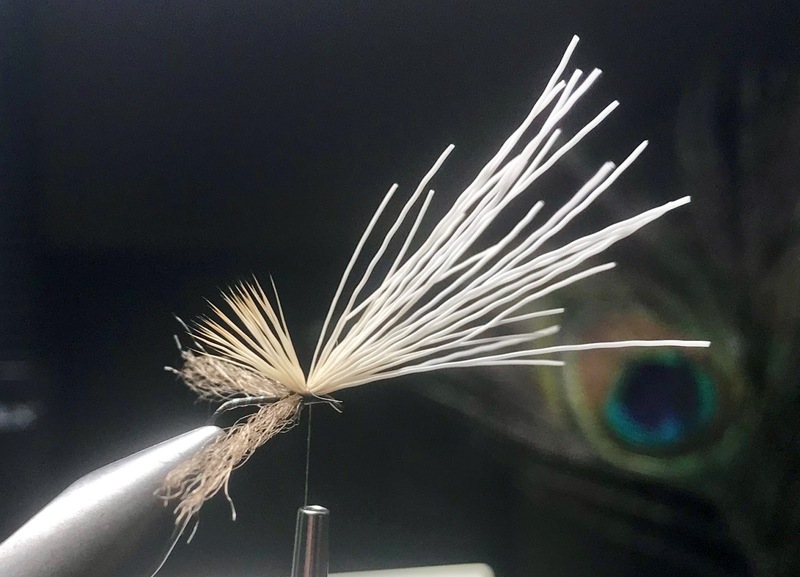 The longer wing materials will allow you to wrap the hackle over the spent wings and around the base of the elk hair wing and butts without catching it. Make the spent wings about 2X the hook shank length, and cut the elk hair right at the skin so you have plenty of length. The finished fly from angle above. And here's the video we did with Tim Flagler on tying it from start to finish. 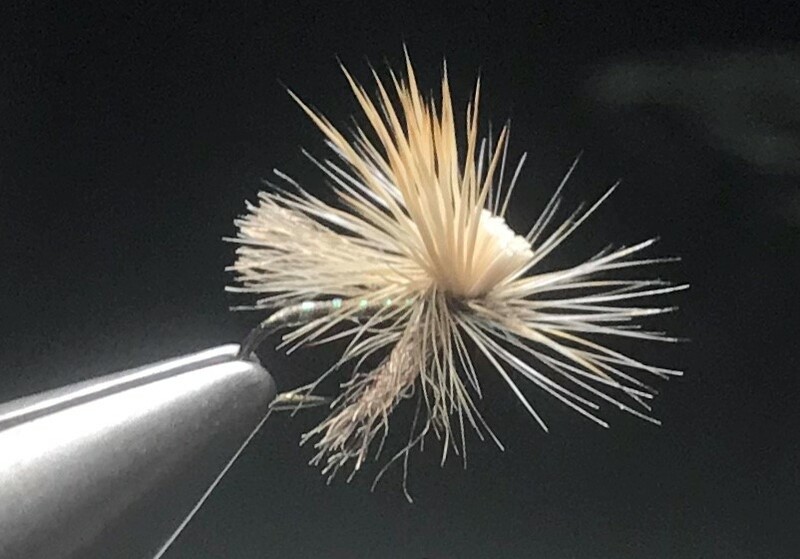 Great looking fly, I'll definitely be trying it. I don't know why I've never tried imitating a spent caddis specifically, in retrospect it seems pretty silly not to have done. RM - It's a great fly, floats well and you can see it in fading light, and it works!. You can change the colors to imitate other caddis and mayfly emergers. 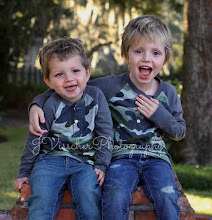 Unknown - Thank's for the link, I am going to post it. Hi Matt. That would be me.